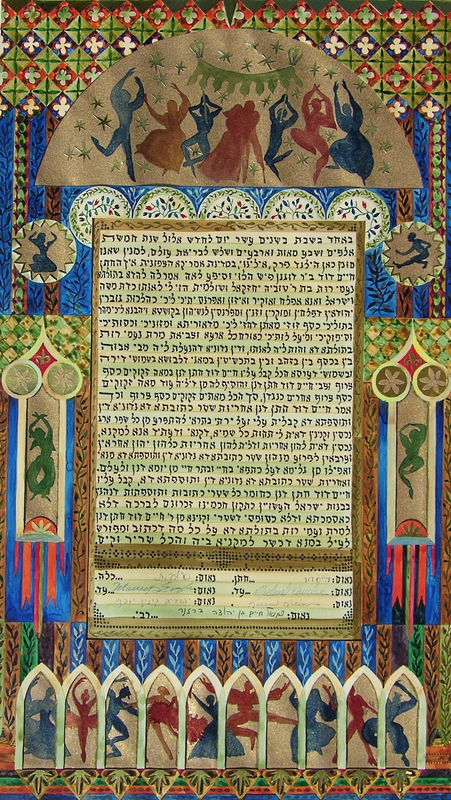 Ketubah, Judith Joseph, 1983. Watercolor, ink, ricepaper, ragboard. I get a funny feeling when someone brings me a piece of my work from decades ago. I’m nervous. Will the work look awkward? Will it look amateurish? Will this work of art be the painted equivalent of looking in a mirror and seeing a juvenile version of myself, with braces on my teeth and pimples on my face? The oddest thing is when I don’t even remember the work. I look at it, and I recognize the style, it’s unmistakably mine, yet I have no recollection of having made it. 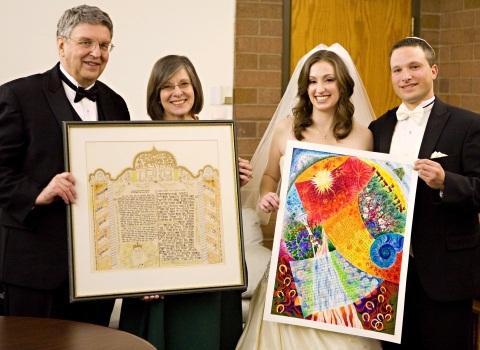 The ketubah pictured here was made for a dear friend’s wedding in 1983. I must have been in a hurry, because I didn’t get a photo of it, which is very unusual for me. She moved with it far away, and I didn’t see it (although I have seen her) for at least 25 years. She recently loaned me the ketubah so I could photograph it for my portfolio. I never did a similar work, before or since. 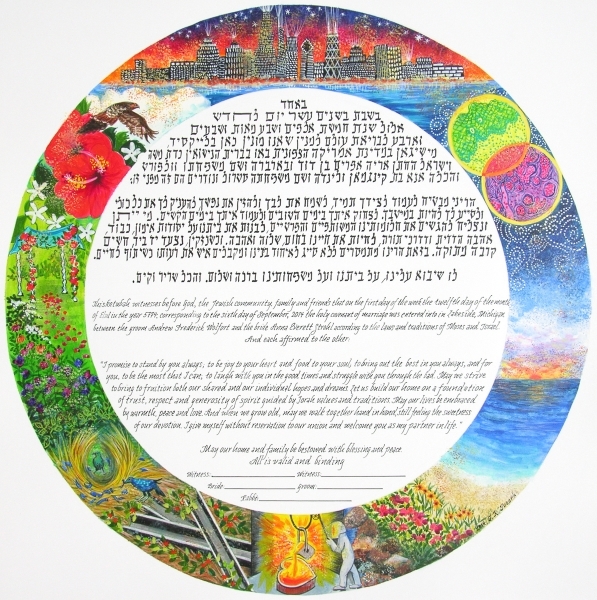 The arches in the ketubah are cut into 4-ply ragboard, so there is a layered, dimensional quality. I used metallic gold ricepaper, which is still shiny. I was in a phase of using silhouetted dancers in my paintings, they appear here. I look in the mirror of the past, and I see my younger self, smiling and joyous for my friend. What is it like for you, when you see something you made many years ago?